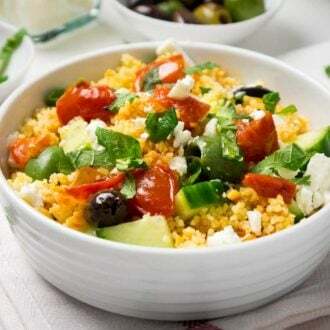 An easy-to-make 20-minute Greek Couscous Salad which is great as a main or side dish. Tastes great warm or cold and can be prepared in advance. In a small pot bring chicken stock and water to a boil. Add 1 tbsp olive oil and 1/4 tsp salt. Turn off the heat and add the couscous. Stir with a fork and let sit for about 10 minutes until the couscous is fluffy and has absorbed all the liquid. Heat up 2 tbsp olive oil in a skillet. Saute chopped onion until glossy then add finely diced garlic and saute for one more minute. Add the tomato paste and saute briefly. Add the tomatoes, season with salt, pepper and a pinch of sugar. Saute for 5 minutes. Stir occasionally. Transfer couscous to a large bowl and fluff with a fork. Add the tomato mixture, basil and mint to the couscous. Fork through until combined then add cucumber, feta, and olives. Serve warm or cold. This salad keeps fresh in an airtight container in the fridge for up to 2 days.